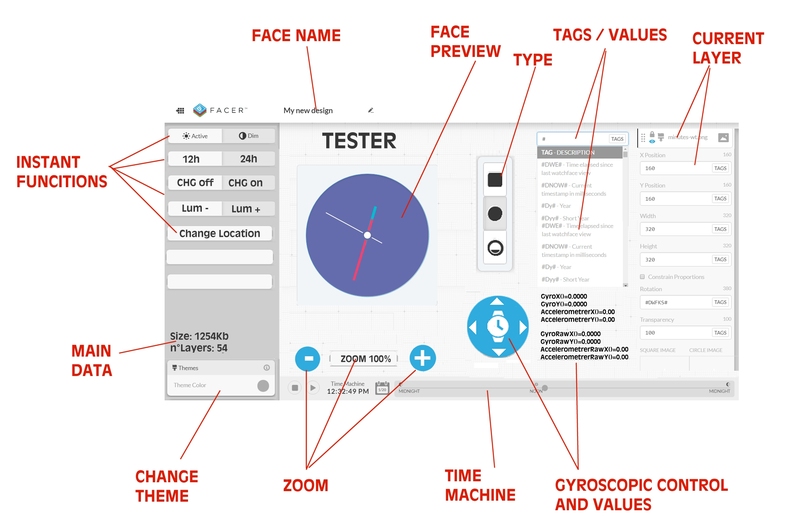 This is a simple concept of what could be a TESTER tool between the creator and the publication. It should obviously have the Time Machine and a gyroscopic motion simulator as well as a series of immediate functions to be tested such as, DIM / NORMAL, CHARGE on / off etc.etc. It should also allow modifying the location of the simulator in order to verify the behavior of UTC functions. It should allow you to zoom in on the face and have a preview of the chosen theme. You should be able to click on the face and see the selected layer with all the parameters and their values. There should also be a list of all the TAGS and the possibility to see the value in addition to being able to insert the desired values ​​(for the pedometer and the BPM for example). This should also be extended to variable TAGs (from 1 to 6). With such an instrument one could study the faces better avoiding errors or inaccuracies but above all improving their development. Rather than writing all these concepts in the abstract, I preferred to graphically outline their meaning. I hope it can be useful! I had some similar ideas on an older post here.